Good morning, and welcome to the Federal Reserve Bank of New York. Today is the second and final day of our conference on mortgage contract design. We are hosting this conference, in association with the NYU Stern Center for Real Estate Finance Research, because we view mortgage design as an important policy issue, with implications for monetary policy, household finance and risk management, as well as for the structure and stability of the financial system. Mortgage debt is, by far, the largest household financial liability. According to New York Fed data2, mortgages and home equity lines of credit make up 73 percent of U.S. household debt, amounting to $8.7 trillion in liabilities outstanding. Mortgage design also varies in striking ways through time and across countries and even regions; for example, in terms of the sensitivity of mortgage rates to market rates, borrowers’ ability to pay down or increase the loan balance, the ease with which loans can be modified, and the rights of junior lien holders. Reflecting this international diversity, we are very happy to have panelists from the United Kingdom, Sweden and Denmark speaking today, as well as representatives from many foreign central banks and other international organizations in the audience. This is also a particularly opportune time to think about mortgage contract design given the ongoing debate about housing finance reform in the U.S. , and the future of the government sponsored enterprises Fannie Mae and Freddie Mac. But debates about mortgage design are definitely not new! In fact, 40 years ago the Federal Reserve Bank of Boston hosted a well-known conference on "new mortgage designs"3, which included Franco Modigliani, later awarded the Nobel prize in economics, and current Federal Reserve vice chair Stanley Fischer. An interesting contrast to today—the main focus of the Boston conference was the design of mortgages to deal with a high and volatile inflation environment. The financial crisis and its aftermath have brought mortgage contract design back into sharp focus. In my remarks today I will focus on one aspect of mortgage design; namely how the prevalence of adjustable rate mortgages, or ARMs, may affect a number of aspects of economic performance, including the pass-through of monetary policy, the sharing of interest rate risk, and the use of resources spent on refinancing. The federal funds rate dropped from 5-1/4 percent in August 2007 to the current 0-25 basis point range starting in December 2008. Longer-term interest rates such as the yield on 10-year Treasury bonds also declined significantly, from about 5 percent in mid-2007 to a range between 2-3 percent in recent years. 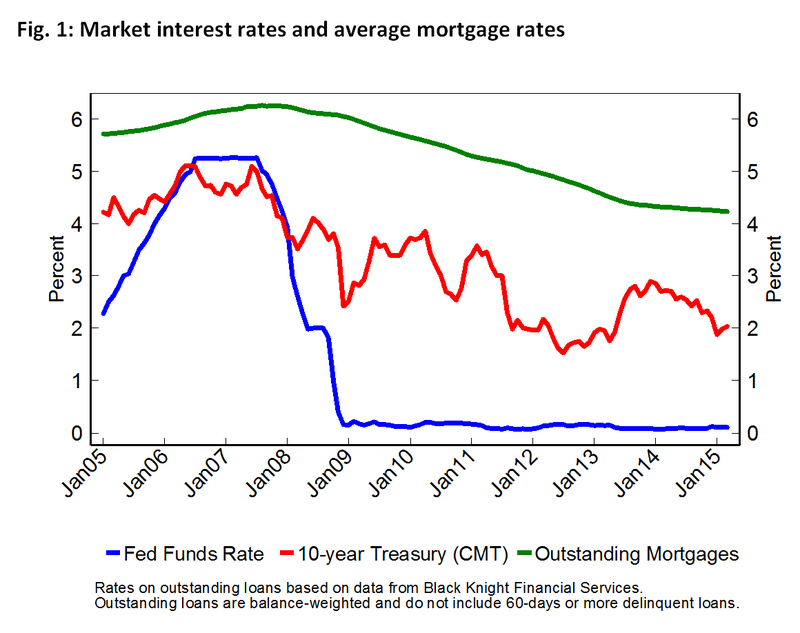 As illustrated in the chart, however, the average interest rate paid on the total stock of outstanding mortgages in the U.S. decreased relatively slowly and by a smaller amount over this period. The source of the stickiness in mortgage interest rates is that the vast majority of outstanding mortgages in the U.S. are long-term fixed-rate mortgages, whose pricing is tied to long-term interest rates, and which require borrowers to refinance to benefit from a decrease in market rates. This refinancing process in earlier episodes has worked quite smoothly in transmitting lower market interest rates to the mortgage market—in particular during the large refinancing wave in 2002-2003. But during the crisis, many borrowers were unable to refinance either because their property was worth less than the outstanding mortgage balance, or because they didn’t otherwise fulfill underwriting criteria that had also become much more stringent than during the boom. These features surely limited the transmission of accommodative monetary policy through households’ balance sheets. Furthermore, borrowers that were able to refinance and benefit from lower interest rates were mostly those with high credit scores and relatively lower debt balances. The Administration responded to this limited pass-through by introducing programs such as the Home Affordable Refinance Program, or HARP, to enable refinancing for borrowers with high-LTV loans backed by Fannie Mae or Freddie Mac, or facilitating streamline refinances of FHA loans. While these programs eventually reached a large number of borrowers, their implementation was complex. As a simple mortgage design counterfactual, had more borrowers had adjustable-rate mortgages, which are generally indexed to short-term interest rates, the pass-through of lower market interest rates would have been more direct. 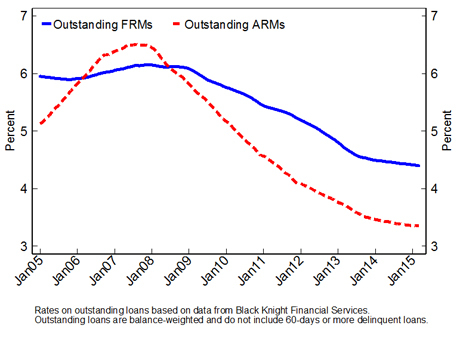 As the Chart illustrates, the average interest rate on outstanding ARMs declined more rapidly than the rate on FRMs, even though in the U.S. most ARMs only adjust after a rather long fixed-rate period (often 5 or more years) and then only do so infrequently (generally once or twice a year). 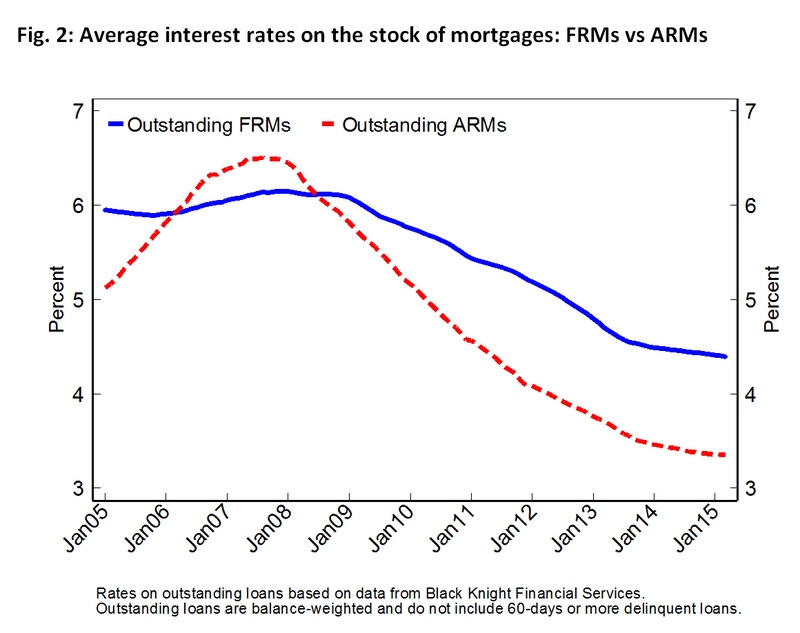 Crucially, ARM interest rate resets reduced mortgage payments without requiring the borrower to refinance, thereby benefiting a broad range of borrowers, including those with little or no home equity and/or low credit scores. Research conducted here at the New York Fed has shown that these lower interest payments resulted in large declines in these borrowers’ default probabilities4. And two papers presented in our academic sessions yesterday found evidence that these borrowers responded by increasing their consumption of durable goods5. All this implies that a higher share of ARMs at the start of the financial crisis would likely have enhanced the effectiveness of monetary easing in reducing foreclosures and stimulating the macroeconomy. More generally, the pass-through of monetary policy is likely to be stronger if a high share of mortgage debt has an adjustable interest rate, both in easing and tightening phases of the economic cycle. 6 As a result, the amplitude of interest rate adjustments by the central bank may not need to be quite as large to have the same economic effect. This may be a particularly important consideration when the economy is at or close to the zero-lower bound on interest rates, as the U.S. and many other economies are today. I hope I have whetted your appetite for today’s events. 2 See the Federal Reserve Bank of New York Quarterly Report on Household Debt and Credit. 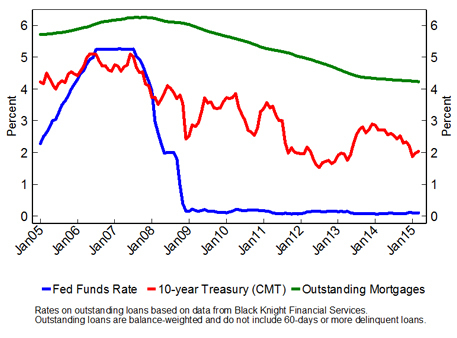 3See New Mortgage Designs for an Inflationary Environment for the agenda and proceedings. 4 See Tracy and Wright, 2012, Payment Changed and Default Risk: The Impact of Refinancing on Expected Credit Losses, Federal Reserve Bank of New York Staff Report No. 562; and Fuster and Willen, 2012, Payment Size, Negative Equity, and Mortgage Default Federal Reserve Bank of New York Staff Report No. 582. 5 See Keys, Piskorski, Seru and Yao, 2015, Mortgage Rates, Household Balance Sheets, and the Real Economy, and Di Maggio, Kermani and Ramcharan, 2015, Monetary Pass-Through: Household Consumption and Voluntary Deleveraging. 6 This is also an implication of the model presented in Auclert, 2015, Monetary Policy and the Redistribution Channel. 7 See Agarwal, Driscoll and Laibson, 2013, "Optimal Mortgage Refinancing: A Closed-Form Solution", Journal of Money, Credit and Banking, Vol. 45, No. 4, pp. 591-622. 8 According to data from the Home Mortgage Disclosure Act, there were 31.8 million refinancings of first-lien single-family mortgages over 2008-2013, with an average (median) loan amount of $212,000 ($174,000). 9 For evidence on the importance of capacity constraints for time-varying margins in mortgage pricing, see Fuster, Goodman, Lucca, Madar, Molloy and Willen, 2012, The Rising Gap between Primary and Secondary Mortgage Rates, Federal Reserve Bank of New York Economic Policy Review, 19(2), pp. 17-39. 11 For evidence that lenders are less willing to originate FRMs if mortgage securitization markets are illiquid or frozen, see Fuster and Vickery (2015), "Securitization and the Fixed-Rate Mortgage", Review of Financial Studies, 28(1), pp. 176-211. Research presented in yesterday’s academic sessions finds that a bank’s access to external bond finance influences the composition of mortgages it originates: see Foá, Gambacorta, Guiso and Mistrulli (2015), The Supply Side of Mortgage Finance.